Summer time is not the best time to be a goth. Witness: http://gothsinhotweather.blogspot.com/. But like rogue nanobots, we learn and adapt over time. I spend much of my time in black jeans and t-shirts, which requires some adjustment if I have the misfortune be outdoors during the reign of the Daystar. Aside from making my peace with the totally un-goth idea of shorts, I’ve developed some other coping mechanisms for the people who sit in the shade all day at life’s Pool Party. I’ve been massively impressed by this product. Most sunscreens and lotions are unbearable for me to wear because my face is so naturally oily. I have sensitivity issues with sunscreens that can cause my face to break out in terribly attractive hives. Plus, all the extra moisturizing ingredients usually cause me to break out. All this for a weak SPF that may be slightly more effective than wearing a napkin over your face. 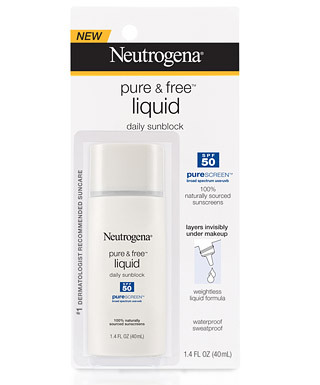 All hail Pure & Free Liquid Daily Sunblock! This stuff has powerful SPF. None of that SPF 15 wimpy stuff. This sunscreen has a watery texture that dries matte and relatively clear. There is a white cast that may remain barely visible once you’ve applied, but that’s not really much of a goth-deterrent. I put a light amount of Bare Essentials mineral foundation powder on top just to lock everything down and make sure there’s no mimeface going on. The container is small, but it really only takes a few drops to cover your face and neck. If you have a foundation or lotion that you prefer, you can mix it with this sunblock. So far, I haven’t experienced any sensitivity or breakouts while using this lotion. This is sure to be vampire-approved. Black Phoenix Alchemy Lab Ultraviolet. I’ve mentioned Ultraviolet here before. As the days reach 80 degrees and higher, I’ve found the cold minty allure of Ultraviolet perfect for keeping cool. I’ve put much thought into describing this complex scent. Here is the Lab’s description: Electrifying, mechanized and chilly — the scent of crushed blooms strewn on cold metal. Lush violet and neroli spiked hard with eucalyptus and a sliver of mint. The first thing you smell is the eucalyptus followed very closely by violet. The eucalyptus here smells therapeutic but slightly soft, not like weird health store cough drops or those dried flower arrangements. The idea of cold and mechanized is prominent because of the ubermodern contrast between sharp herbal notes and soft florals. I’m not sure I could identify neroli save as a light floral note. The overall effect is fresh and unique. It’s not so green it veers into air-freshener territory. I don’t think I’ve ever encountered anything remotely as interesting as Ultraviolet. I am seriously into this scent. You may feel the cold effect of this perfume when you apply. I’ve mixed mine with vodka in a spray bottle for easier application and because the oil as it comes from the Lab is quite concentrated and can cause me some skin sensitivity problems. Once diluted, though, I have no reactive issues at all. If Ultraviolet doesn’t raise your headstone, I also recommend Embalming Fluid or Undertow. While visiting friends in Miami we had this beverage that was bright green and icy and just delicious. It’s called Limonana and it’s pretty simple to make. Get yourself some lemonade. You can make your own or cheat and get something from the store. I like to get Simply Lemonade to make the recipe a little easier. You’ll also need mint, a fair amount of it. I haven’t yet experienced too much mint in this beverage. Pour the lemonade into the blender. Add a cup or so of ice. A big handful of mint leaves. Blend it all until you have what looks like a frozen Slurm. Drink. Add vodka sometimes if you feel the need for a bit of Demon Booze. Rum is also good. I guess you could do gin, but you’d better be wearing a straw boater and a linen suit if you follow that Left Handed Path. If you live in a hot climate, you’ve likely developed some coping methods of your own that I’d be interested to hear. Let me know in the comments. This entry was posted on June 8, 2011 at 11:01 am and is filed under Uncategorized with tags eucalyptus, hot, lemon, limonana, mint, pale, skin, sunscreen, ultraviolet, violet. You can follow any responses to this entry through the RSS 2.0 feed. You can leave a response, or trackback from your own site.